The large key, large print VisionBoard 2 features 1 inch square keys with extra large letters and numbers for increased visibility. Excellent for visual assistance and for children. 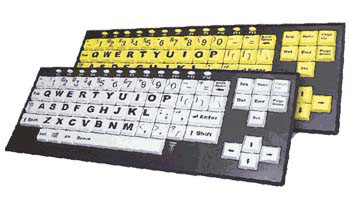 The VisionBoard2™ keyboard improves readability and reduces eyestrain with high-visibility black-on-white, or black-on-yellow letters and numbers. Its oversized 1inch square keys also improve contact and control to help those who finds it painful or difficult to type with a typical keyboard. A perfect keyboard for seniors.